Individual rushing statistics have been added to the “Individual Statistics –> Rushing” tab on the menu. 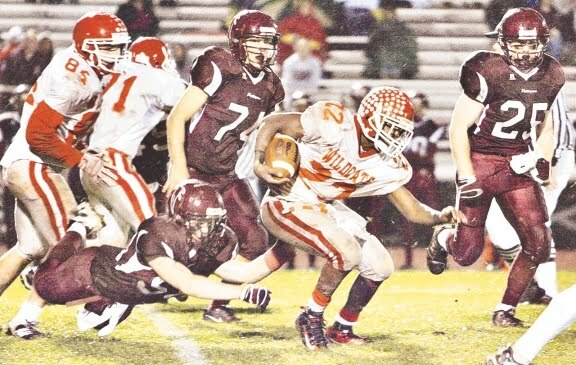 All rushing statistics shown here were collected from archived copies of the Pennsylvania Football News’ Keystone Clubs and are current through the end of the 2015 season. There have been 2,547 seasons in which a Pennsylvania high school football player has rushed for at least 1,000 yards. A number of these instances involve the same player rushing for 1,000+ yards more than once in his career. The only players to lead the state in rushing yards twice are LeSean McCoy (2003 & 2004), Ryan Brumfield (2009 & 2010) and Dominick Bragalone (2013 & 2014). The lowest total to lead the state since 2000 was 2,272 by Robbie Frey of Lehighton in 2005. That ranks 75th in single-season history. The highest total not to lead the state was 2,974. Lakeview’s Blake Reddick rushed for the 6th-highest total of this century, but finished 2nd in 2013. Reddick finished 294 yards behind South Williamsport’s Bragalone. Through 2015, only two players have rushed for 4,000+ yards (Bragalone and Zach Barket). Five have eclipsed 3,000 yards and 177 have hit 2,000 or more. The list shown here is as accurate as possible, but there may still be errors or omissions. Additionally, any information pointing toward players who rushed for more than 1,000 yards before 2000 would be greatly appreciated. This is a growing document and any assistance in including as many players from past years is helpful.